Fennel fronds act as an extremely aromatic herb. The fronds are light in texture and tend to float on salads, salmon, and more as a way to add flavor without weight. Fennel fronds are also quite beautiful- their bright green color pops in autumn dishes and the many offshoots create an almost fractal pattern that draws the eye. Fennel fronds are classicly paired with fish because they have a slightly sweet flavor that enhances fish's natural sweetness. Fennel fronds, like the plant as a whole, taste like anise or black licorice. 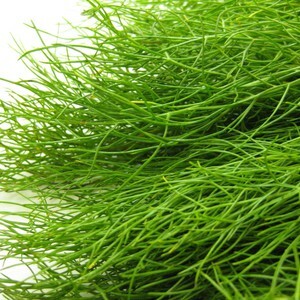 Fennel is very healthful as a source of Vitamin C and has been used medicinally for centuries to treat upset stomachs.